Are you starting to think about downsizing your life? Here are some great tips to get you started. I compiled these tips as I was getting ready to do a half hour talk/discussion with a group of women from a Church. I was told that it was an older group of ladies who have collected a lot of stuff over the years. They wanted to know how to decide what or how to get rid of things. I asked for advice from my fellow Professional Organizers. These are some of their suggestions edited and in my own words. 1. Focus on one group of items at a time. You may have a number of jackets in different closets in your home. Instead of focusing on one closet, focus on just jackets, gather all of them and donate the ones you haven’t worn in two years. Same with paper, disposable bags, clothing, shoes, glassware, Christmas Decorations, etc. Once you have gone through specific areas, and purged what you can then you are ready to re-organize the specifics for your space. 2. Think about having things in your home that fit with your current life. We are not who we used to be and so our things should make that transition too. 3. Having some simple systems set up for managing incoming paper, junk mail, bills, shredding, recycling, downsizing and keeping what is important is really helpful. If it is working, there is no need to change or fix it. 4. It is okay to ask for help. There does come a time when we realize we cannot do everything. Maybe, you could use some help with the heavier work or some help with Christmas decorating. Enlist a friend, family member, mentor or a Professional Organizer like me. 5. Keep only the most important things that your children or other family members will want to remember without feeling burdened or weighed down. Include your family members and ask them what they might want now as you are going through things. You may find that they don’t actually want your stuff. 6. Tell your loved ones (friends and family) that as you have become more wise, you realize that stuff isn’t important, that connections and relationships with people are. That is why you are downsizing. You want to see them enjoying their lives. You want to share in their happiness, enjoyment, and appreciation for life. 7. It is a gift to your children and family to “do your own work”. Being overwhelmed is not enough. Your family will be grieving you, don’t make them resent having to go through decades of stuff at the same time. Ask for help from a Professional if needed. 8. Sentimental items can be difficult to let go of. Keep the best of the best, take a picture of important items that you want to remember, honour the fact that the item was appreciated and served its purpose and donate the rest. Someone else can now get some use out of the item. You likely are going to need to make some hard decisions as you do this work. 9. Having time to do this work is a blessing. This is a process and a lot of emotions and feelings will come up. It is important to take the time you need to do this work. If you have a good balance in your life you will be more successful. 10. Be kind and compassionate to yourself. This is intense personal work and it can bring up all kinds of emotions. Reward yourself for a job well done and pat yourself on the back. This group of women were such a pleasure to meet with. They know each other well so were very chatty, insightful with a lot of wisdom and good ideas to share. They asked a lot of great questions too and I am sure they felt inspired and motivated to get to work. Below are some powerful quotes from a Professional Organizer who was sharing her personal story about her mother. “I believe her mind focused on “leaving quantity” rather than “living quality”.It isheart-wrenchingly painful for a child to have to filter through their parents possessions while placing the vast majority of it in the trash bin, not to mention the incredible expense. I would much rather have had fewer “things” to go through & have had memories of my parents home as one that was clean, welcoming, serving of their lifestyle and needs and happy, rather than one that was piled high and junked up with no space for life to flourish”. This book is written by a woman whose parents have both passed away and they have left behind a huge mansion of a house filled with years and a history of stuff. The author spends a number of months going through everything, she includes her siblings (three brothers) and they spend time reminiscing about their lives. This is based on a true story and it took place near Toronto on Lake Ontario. This is a fun read. Margareta writes about going through every area of your home and thinking about the future and what you will be leaving behind for your loved ones. It really helps you to be thinking about your life now as well. 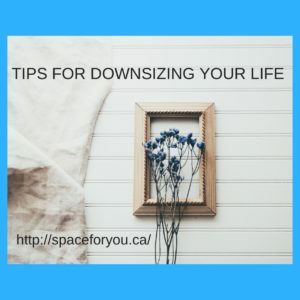 Do you have further resources to share to help with downsizing? Would love to hear from you. Please post in the comments below. This entry was posted in De-Clutter Your Life, downsizing, families, Organizing and tagged decluttering your life, downsizing, Making Change, motivation, organizing. Bookmark the permalink. I really want to read, “They Left Us Everything.” Thanks for the reminder of this book because I’ve been wanting to read it. I’m speaking on this topic in the new year, so this was very helpful. Thank you for sharing! I know, me too and so close to home. Can’t imagine having to go through so much stuff, making decisions on it and getting rid of things. Its an interesting book and close to home as the setting is near Toronto on Lake Ontario. I read the book and then proceeded to give it away so may need to get it again. I am interested in hearing about your talk. Thanks for your comment. I can so relate to this Janet. I have a tea set that belonged to my grandma, I have never used it but my mom talks about it, thinks its worth money and says I need to keep it forever. What?? Anyway, its now packed up in the basement. Oh my!! I agree! It takes time to accumulate stuff so accept that it will take time to get rid of stuff too. Two to three hours each week will give you enough time to go through a smaller area and then, that week, you can donate or trash the items. Before starting to purge the other areas, it’s essential to get rid of the previous things. Fully completing the purging process will give you the gratification and sense of completion to motivate you to do another area. I love all of the advice that you collected. This post resonates with me deeply as I spent a good part of this past year clearing out my parents’ home of almost 60 years. It’s not that my parents kept everything. They did an edit from time to time, but they also kept a lot. It was up to me (and my siblings) to decide what to keep, to toss, to donate, to sell, or to pass on. Many of the grandkids and my siblings wanted things, which helped. Even so, there were many things that had to go. It made me hyper-aware that I don’t want to leave all of our stuff for our kids to sort. It’s up to us to edit sooner than later. I like the ideas in the Death Cleaning book which encourages us to take responsibility for our things as an act of love. Yes, I really like that book as well. Just wish it was called something different. Would like to get a copy for my mom but I know she wouldn’t like the title. Its interesting that your parents did part with things over the years but still ended up with a lot of stuff. It must have been quite the journey going through everything. I know you did blog about this as well which I am sure is helpful to yourself as well as others who read it.